It looks like the US offered India Patriot missiles (probably the PAC-3). While there has been reporting of offers back in 2004, this Times of India story (HT xThreats.com) indicates that the US Defense Department made a presentation in February of this year. The Russians are pitching their S-300V system, with visits dating back to 2003, along with the Israeli Arrow II (joint developed with the US). 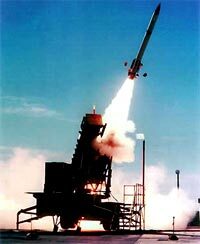 "The Patriot is an air-defence system which can defeat both attack aircraft and tactical ballistic missiles. Sources said that the sale of the Patriot might be linked to India getting on board the national missile defence (NMD) as it can also be integrated into the broader NMD framework. " "In an indirect reference to the possible sale of Patriot Missile defence systems to India by the US, China today hoped that the activities of “relevant countries” will be conducive for the maintenance of peace and stability in South Asia. “We have taken note of reports that a certain country plans to sell anti-missile weapon systems to India,” Chinese foreign ministry spokesman Kong Quan said, without naming the United States. “We hope that the activities of relevant countries will be conducive for the maintenance of peace and stability in south Asia,” he told reporters." China's reaction is understandable, given DEL's assertion that the US is hoping to draw India into a strategic alliance to counterbalance against China [See DEL here, here and here]. "On Navy-to-Navy cooperation between India and US, [Defence Minister Pranab Mukherjee] said no specific offer for close ties between the two navies but they have been deepening their professional interaction through joint exercises, high level visits and possible procurement options." The amount and diversity of US offers to India is unrivaled by the French, Russians or Chinese on a multitude of fronts. If the Indians believe America is serious about promoting their security and economic interests, India has a great opportunity in partnering with the US. The Asia Times had an article yesterday concerning defense-related fraud in the previous regime of the government of India. This has led Congress to call for an investigation. India is in the process of spending $15 billion in modernization of its armed forces. Any investigation could slow down the already lengthy process of defense procurement. "Arms manufacturers from the US, Italy, France, Russia, South Africa and Israel, with active backing from their respective governments, are lining up to ink deals with India for the supply of military equipment ranging from fighter aircraft to submarines, jets, radars and more. However, New Delhi's latest move to ask the Central Bureau of Investigation (CBI) to probe arms deals signed by the previous Bharatiya Janata Party (BJP)-led government during and after the 1999 Kargil border conflict with Pakistan may throw a further wrench into the process of arms purchasing, which is quite protracted in any case." The defense scandal may affect purchase contracts with the French, Dutch and South Africans.
" One immediate casualty has been the further deferring of the purchase of French Scorpene submarines. The Indian navy was looking to ink the $3.2 billion deal finally, which has been under negotiation since 2002, until politics took over. The problem is made more acute by the fact that a part of India's existing fleet comprising Soviet Foxtrots and Kilo-class submarines are to be decommissioned in the next five years. The CBI has also been asked to look into all contracts with Denel, a South African firm accused of paying kickbacks to influence a deal to sell anti-materiel rifles to the Indian army. The contract for supply of bunker-buster rifles was clinched with the previous BJP government two years ago and part of the arms shipments have already been made. Denel has denied any foul play and issued a statement saying that the deal went through the proper channels and was above board. It can be recalled that the allegations of kickbacks from Sweden's Bofors firm to clinch the sale of 410 howitzers to the Indian army in 1986 in a deal worth $1.3 billion ultimately led to Rajiv Gandhi being ousted as prime minister. Though the Bofors guns played a key role in the Kargil conflict, the scandal created major delays in the purchase of modern weapons further on, with Defense Ministry bureaucrats and military officials chary of clearing arms purchases for apprehension of later allegations of bribery. Prime Minister Manmohan Singh has already gone on record to say that the 'defense scandals' will impact the arms purchase. 'We have to make every effort to ensure that these recent events do not create a disincentive for taking timely decisions regarding armaments [purchases],' he said." It will be interesting to see what effect, if any, this has on the possibility of a large US defense purchase by India. Since the US offer is new and not associated with past corruption, it may now be a more palatable offer to the Indians and one that can move ahead faster than a French arms purchase. Prior DEL posts on Indian defense purchases of US military hardware and of US-Indian foreign relations can be found here, here and here. There are many great blogs on the internet and you can see Dawn's Early Light's Influentials to the right. However, there are some up and coming blogs as well that deserve some particular attention as well. I would like to point you to them and hope you enjoy them as much as I do. EagleSpeak - A retired Captain of the USNR and practicing attorney. 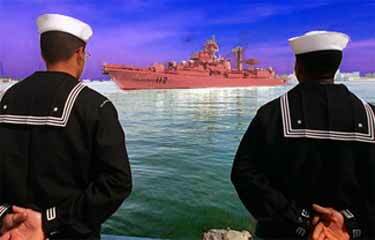 He covers a good deal of naval and open sea issues around the world, especially in Asia. For a good link on the India acquiring "aircraft carriers" see here. Another very interesting post on piracy and oil here. 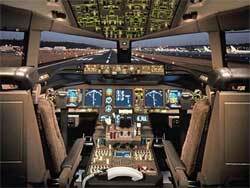 Curious about the future of aviation and UAVs? There is no better site than "Unmanned Aerial Vehicles (UAVs)" (clever name isn't it?). This site is from Australia and covers what different militaries are doing with unmanned aerial vehicles. This post is interesting because it combines submarines and UAVs. The Word Unheard, by a former US Marine has some interesting analysis on the War on Terror, the Main Stream Media (he used to work for a SoCal TV station) and military equipment. For a scary post on al-Zarqawi planning a chemical attack on Germany, click here. Blog tdaxp covers the new round of Base Closings and has a post regarding the Bush administration recess appointment to blog fellow grumpy Republican Trent Lott's attempts to politicize it here. Readers are encouraged to email Dawn's Early Light with other good blog reads. Update: Reader Larwynn writes DEL about Jack RIsko's Dinocrat blog. 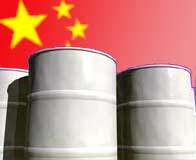 He has two very interesting posts on China regarding bad bank loans and future oil demands. Bill Roggio from the Fourth Rail and Winds of Change sent Dawn's Early Light an email suggesting a follow-up post to these DEL entries "US Agrees to Sell F-16s to Pakistan", "DEL Makes A Prediction" and "Supporting Evidence on DEL Prediction?". DEL has taken the position in the above linked posts that Secretary Rice's visit was to cement a new long-term strategic US-Indian alliance to counterbalance growing Chinese hegemony in Asia. Given India's growing economic power, coupled with its democratic government, something of vital importance to the United States as it readjusts its strategic interests post September 11, 2001, it makes sense the US would be willing to offer substantial rewards to partner with India. The completion of the canceled sale of US F-16s to Pakistan that was interrupted in 1990 due to Pakistan's nuclear testing is a natural reward from the US to Pakistan for its stalwart support in the Greater War on Terror. As Aruni Murkherjee argues, this should come as no surprise to India, nor should it tip the balance between New Delhi and Islamabad. "The reaction has been quicker than expected. Peeved at the US decision to supply F-16 fighter jets to Pakistan, India has made it more than apparent that it is not at all happy and will play hard to get in all defense negotiations with the US. Making India's irritation clear, Delhi has announced new defense orders to Russia, Germany, Italy, Israel and even Qatar, worth a total of US $746 million. Making no bones about New Delhi's annoyance, even as US Ambassador to India David Mulford has tried to placate matters, Indian Defense Minister Pranab Mukherjee announced on Tuesday that the government had cleared the purchase of 12 used Mirage 2000 V fighter aircraft from Qatar and 11 Dornier 228 aircraft from Germany for maritime surveillance, virtually as a gesture set against the US offer to sell PC-3 Orions to India." The $746 million would likely not be paid out in one current defense budget year, and only represents 5% of 2004-2005 Indian defense spending of US $15 billion (see February 5, 2005 Asia Times article here by same author). The same article hints at a possible purchase of 126 US F-16s: "The Indian defense community's wish list is long, which they feel is necessary to modernize the country's armed forces. These include a proposal to purchase F-16 fighter jets, Scorpene submarines and long-range rocket systems. The proposal to buy 126 F-16s - at $25 million each over five years - will itself cost the exchequer $3 billion. " The Siddharth Srivastava article argues mainly the economic angle for why the US was so motivated to sell the F-16s, namely President George Bush's home state of Texas would receive the financial benefit for 5,000 jobs. "Prior to the Indian reaction to order arms from other countries, the US decision was also seen as a win-win situation for Washington. For planners in the administration of US President George W Bush, it was a clear instance of geostrategic diplomacy being cloaked to promote the highly competitive business of arms sales, the potential of an arms race in South Asia set aside, as long as it benefited the US arms industry. There are reports to suggest that the sale to Pakistan may have saved 5,000 jobs at Lockheed Martin, the manufacturer of F-16s, located in Texas, Bush's home state." "There is more bad news for the United States. While the US has placed all its cards in the open, there are murmurs of protest in the Indian defense and foreign ministries against any long-term arms arrangement with the US. The US is seen as an unreliable arms partner, unlike the history of such ties with the Russians, the French or even Israel. The main fear is of sanctions, which is built into the entire US system of arms sales, and an arena that is within the comfort zone of US diplomatic arm-twisting. The French, for example, stuck with India even post-1998, when India turned nuclear, despite sanctions by the rest of the Western world." This is the basis of Mr. Srivastava's argument. While it is filled with very well-sourced detail of the ins and outs of Indian defense procurement ideas, it does not deal with the larger strategic objectives of both India and the United States that, in a post 9/11 world, are quickly converging. "On her recent visit to India, US Secretary of State Condoleezza Rice said, "What we're trying to do is break out of the notion that this is a hyphenated relationship somehow, that anything that happens that's good for Pakistan has to be bad for India, and vice versa." [DEL: more on Sec. Rice's comments on the hyphenated relationship here] India's vehement and open opposition to this deal and the dejected expression that followed it will only pour cold water on the country's aspirations not to be equated with Pakistan in most geopolitical discussions pertaining to South Asia. India looks on itself as a rising regional, and possibly global, economic and military power, yet an indifferent attitude to this deal would have gone a longer way to bolster that image than the sniffles of a child who didn't get his cookie. " "There are reasons to believe that this deal would do little to alter the strategic balance in the subcontinent. First, as a US State Department official put it, India had been contemplating a 'very large' purchase of fighters long before this deal was sanctioned. Models in the race include French Mirage 2000-5s, Swedish JAS-39 Gripens and Russian MiG-29s. Thanks to the recent announcement by the US, India can also add F-16s and F-18s to this list. Lockheed Martin has also gone a step beyond and confirmed that it will be willing to upgrade the F-16s to Block 70 levels, especially catering to the particular needs of India, very much as the Russians did with the Su-30. Moreover, even without this new purchase, India already operates fighters at par with if not superior to the F-16 Block 52 being offered to Pakistan, the MiG-29, Mirage 2000 and Su-30MKI. It does not appear that a few dozen F-16s will change the entire dimension in favor of Pakistan." It is likely that India would be able to purchase far more advanced equipment and in greater numbers than the Pakistanis have recently concluded with the US. "Second, although India has constantly denied that it wants to get sapped into an arms race, indulging in one would not necessarily be bad for the long-term interests of the country. After all, one of the reasons the Soviet economy never reached the levels of the US was the massive amount it spent on military hardware. India can do the same - draw Pakistan into an arms race by making some big purchases. Owing to nationalist pressures, Islamabad will be forced to do what it can to match India's rapidly growing capabilities. The defense-spending ratio already stands at 5:1 in favor of India - Pakistan would not feel safe to let it slip further. Once the Pakistani economy was under pressure owing to this race, India could push for economic concessions, such as a South Asian free-trade area, a policy long torpedoed by Pakistan owing to fears of Indian competition. With less money at its disposal to fund infrastructure projects or invest in the economy to create jobs, Pakistan may have no choice but to sign a trade accord and let Indian companies provide jobs to its economy." "Third, India should remember that 'friends are not permanent, interests are'. Pakistan has been favored by the US for the past half a century or so for valid strategic reasons. During the Cold War, it acted as a deterrent to a pro-Soviet India. During the Afghan war, it helped the US and the mujahideen throw the Russians out of the country. After September 11, 2001, President General Pervez Musharraf went out of his way to help in the "war on terror". Even after being exposed to life-threatening attacks by extremists in his country, he has cooperated with the coalition forces in whatever way he can. It is still not clear whether India definitely wants to join the US camp - so why shouldn't the US have an "insurance" partner in Pakistan in the region? It makes sense to the strategists at the Pentagon. What India needs to do is make itself more attractive as a partner than Pakistan. India's obvious advantage lies in its rapidly growing and very large economy. India needs to liberalize quicker and give foreign firms (especially US firms) incentives to invest in India, beyond software and information-technology services. A preferential trade agreement between the US and India would open up huge avenues for businesses on both sides." "Once India made its presence felt in the business lobbies in the United States, its weight as an ally would decisively shift vis-a-vis Pakistan. To put things in context, US-India trade in 2003-04 hovered around the US $20 billion figure, compared with a nearly $300 billion figure for US-China trade. The US attitude toward Taiwan has been affected directly as a result. These days the Pentagon often issues restraining calls on Taiwan, and is surprisingly quiet on China's harsh labor regulations since US companies might be affected as a result. A booming bilateral trade between India and the US would not only be beneficial for a large number of Indians, but would also help the country establish itself as a firm US ally in the region, and ensure US support or neutrality in any future disputes with Pakistan." While Mr. Srivastava has a solid argument built on the detail of different weapon systems and India's just announced $746 million spending spree on used equipment, Mr. Mukherjee grasps the larger, long-term political interests both militarily and economically that will create a diplomatic realignment for both the US and India. Both nations will seek to keep their current nation state relationships content as exhibited in India's purchase of military equipment, from non-US suppliers, to the Bush Administration's sale of F-16s to Pakistan. However, their long-term goals coincide, which is to promote democratic India as an political and economic model over the increasingly aggressive and rising Chinese dragon. The US wants to see India succeed and is willing to offer impressive carrots to India to see it become a counterbalance to China. It is in India's interests to leave behind Russia and France as suppliers and embrace the United States in a larger framework of economic and military cooperation to become a "21st Century Major World Power". Update: The WSJ (paid subscription required) has an interesting article that seems to add credence to the DEL position: "The real story here is that the U.S. is steadily building a broad strategic relationship with New Delhi. Said Mr. Mukherjee, 'cooperation in economic and other areas between the United States and India has increased manifold, but so far there has been no defense agreement between the two states.' One obvious strategic calculation for both countries is countering the military rise of China." Update 2: Publius Pundit has a great post "Using India to Squeeze Totalitarianism?" that addresses the above concepts and has a great focus on Asian energy needs driving some of the decision making process. (March 31, 2005). Also Simon's World has a link to a James Town piece "China's Global Strategy for Energy, Security and Diplomacy" that I hope to post on in the next couple of days. Also Congratulations to Simon making the top 20 list of must read blogs for Publius Pundit!